Learn more about their strengths? Develop compelling evidence for why they need accelerated instruction? Be recognized for their academic prowess? 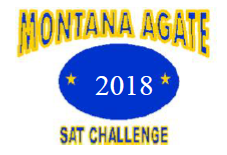 By participating in the Montana AGATE SAT Challenge! Each year, Montana AGATE awards scholarships to Montana 7th & 8th graders who score high on the SAT test and recognizes dozens of students with an awards ceremony, motivational speaker and scholarship medals. It's our way of rewarding excellence and encouraging students to take an "out-of-level" test that will help them understand their strengths and how they compare to students in their grade in addition to the comparison to high school juniors and seniors supplied by the College Board report. Be enrolled in the 7th or 8th grade. Have scored at the 95th percentile or higher on a nationally normed test of aptitude or achievement or on one of the subtests, such as the math or verbal sections. Please contact Joette Speake to ensure that your child's scores have been sent to her.